It's December! We'll be featuring the artwork from one of verynice's volunteers each month. The prompt was to pick a holiday(s) that inspire us to give back. This month we feature the work of Shauna Panczyszyn! Download our wallpaper and celebrate the spirit of giving back with us. 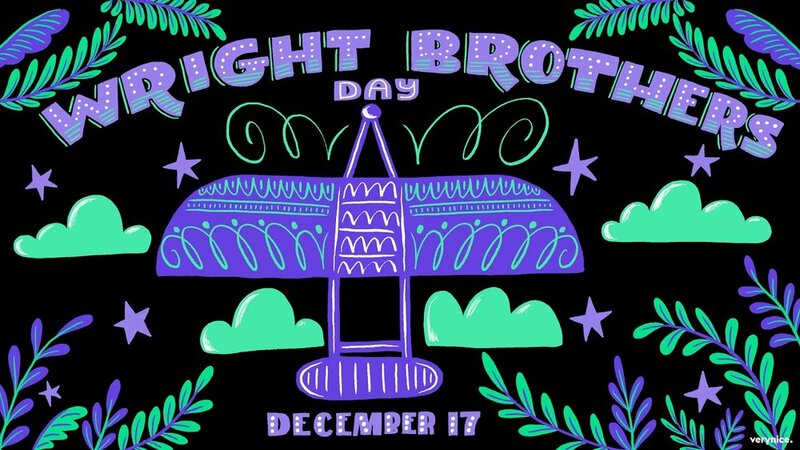 I chose to illustrate Wright Brothers Day because my late grandmother was an avid pilot her entire life, having been an active member of the Chicago area chapter of the 99’s flight group for women. Aviation has been prevalent throughout my family as my grandfather was also a trained pilot, as is my dad, though he prefers fishing to flying these days. My parents live in a fly-in community, so seeing planes flying over my house growing up was a daily occurrence. I felt drawn to it and couldn’t pass up the opportunity to do an homage to something that’s been so much a staple in my life. Though I'm pretty sure my dad never had my sister and I take flying lessons because we would crash the planes on the flight simulator game he had. He tried to teach us very basic things like how to take off and read the dashboard, but thankfully it was a computer game so the only thing injured were pixels. I do pro bono work and enjoy creating it because I want to give back to an industry I love so much. I’ve managed to find my niche early on in my career, and along with that have had many opportunities I would otherwise not have had. Check out more of Shauna's work here!